Researchers have created an image of the ideal president for Russia’s 20-somethings. Young people in Russia do not approve of diplomatic proclivities in a president – they would rather welcome an authoritarian with an unyielding political will. Such was the conclusion drawn by researchers in a study entitled "An Ideal President in the Eyes of Russian and French Students." A seller of antique books came into a lot of money this spring when all of his coronation books of Russian emperors were snatched off shelves as presents, in advance of the presidential inauguration. Sales hit another high this autumn when heavy volumes with the regalia of the Russian empire were in high demand, prior to Putin’s anniversary. The fuss the officials are making is an excellent gauge of public sentiment, particularly in a society that is still inclined to see its president as sovereign. Experts at the Higher School of Economics have arrived at similar conclusions. Political researchers Valeria Kasamara and Anna Sokolova decided to poll students at top universities in Moscow and Paris – namely MGIMO (Moscow State Institute of International Relations), Moscow State University, the Higher School of Economics and the Paris Institute of Political Studies – to create an image of their ideal president and find out what they actually think about their countries’ respective incumbent presidents. This presidential image is upheld by young people who were born in the early 1990s, after the disintegration of the Soviet Union. Furthermore, all the respondents were clearly well-educated, – well enough to make it into the top Moscow universities, at the very least. First published in Based on publications in Moskovskiye Novosti. Victoria Voloshina: For your research, you picked students from leading universities in Moscow and Paris – those who, according to your study, are quite possibly the main candidates for the future political elite of their respective countries. So, what is to be expected from Russia's future elite? I’m not sure what it was: either it was brought on by this year’s opposition protests or a Soviet instinct of prudence. So, I think the future elite will be loyal to the system, hardly any different from the one we have now. Anna Sorokina: When we started out, we expected to see young people thinking critically, or, at least able to justify their political views. And all of a sudden, we received a bunch of Soviet-era clichés in response. V.K. : We have just finished analyzing Orwell’s Animal Farm in a workshop with first-year political science students at the Higher School of Economics. For the first time in my eight-year teaching experience, I had to deal with a lot of accusations against Orwell. One of the most widespread complaints was that Orwell described only the negative features of socialism; but the Soviet Union had a good side to it too: it made the first space flight and won the war. I said, wait a minute, it’s a different genre – a political satire, an anti-utopia. No, they said, it’s slander. They are ready to critically assess the political situation in the United States and elections in France, but not the current state of affairs in Russia, on the grounds that it’s unpatriotic. V.V. : Do they associate volunteer and charity projects with patriotism? A.S: There are only so many students who know about them at all. When we asked French students what volunteer projects they participated in, we got a sea of raised hands in response, and lots of project names. It’s normal there; it’s an expression of their position on civil rights. Here, in Russia, I asked if anyone was part of any non-commercial organization. Out of roughly 100 students sitting in the lecture hall, I saw only two hands raised. V.V. : Young people in Russia list severity among the positive traits for a national leader, far more often than fairness and legitimacy. And I did not notice any mention of such qualities as generosity and wisdom. V.K. : Nor even “competence.” French students see the ideal president as being competent, educated and diplomatic. Russian students, in turn, see him as being harsh, tough and ruling with an iron fist. A.S.: And they call the Russian president a “ruler” more and more often. Not just the head of state, but the “ruler.” It is a strange mixture of Soviet and monarchal ideology. V.V. : The French were also fairly critical of Sarkozy (the poll was held shortly before the presidential elections in France). He failed to show himself to be a tough politician, didn’t he? V.K. : It’s an entirely different story. The French don’t want an authoritarian leader. For them, a president is, above all a person, who cares deeply for his or her country, defends its values and represents it with dignity on the international arena. 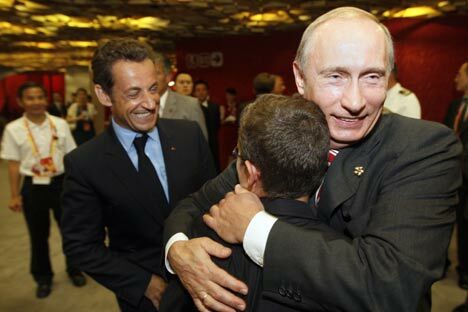 They disliked Sarkozy because he was an upstart, and because he lobbied for his clique’s interests. And, as it happened, they did not re-elect him. The French already have a deeply ingrained system of political values. Freedom, equality and fraternity are more than just words to them; whereas we, having conquered freedom, have ceased to value and cherish it, 20 years later. V.V. : Do you have any idea why? V.K. : Obviously, the life philosophy of “anything but war” has been very viable. Anything, but not the 1990s again; that’s what parents of the “Putin generation” have been instilling in their children. Valeria Kasamara is an Associate Professor and Deputy Chairperson of the Department of Political Behavior at the Higher School of Economics National Research University. Kasamara also heads a political research laboratory at the Higher School of Economics National Research University. Anna Sorokina is a teacher in the Faculty of Politics at the Higher School of Economics Natioal Research University. She also serves as a junior research fellow at the university’s political research laboratory. Some are happy to be paid regularly, others rejoice at the opportunity of travelling abroad. They are afraid of any kind of change. What if it’s a turn for the worse? This is why the generation born in the early 1990s has become so commercial. Most of them are opportunists who place a high value on material wealth, success and career – and not for the sake of realizing their potential, but purely for the money. V.V. : Do young people place any importance on the leader’s personal qualities? V.K. : There is a great demand for honesty. Everyone is sick and tired of everyday corruption, even the most patriotic people. But just a small proportion of Russians questioned in the poll actually linked Putin to this corrupt system. It’s quite the other way round, actually. V.V. : Were there no freethinkers at all among your respondents? V.K. : There were some critical statements, but of a rational rather than emotional nature. Students of physical and mathematical faculties say, “yes, the GDP has grown, but look at its oil component: if we take it away, we’ll hardly get any budget surplus.” Or, “yes, you are raising pensions, but inflation is going steadily up.” People who know their way around figures cannot be easily misled by political slogans.